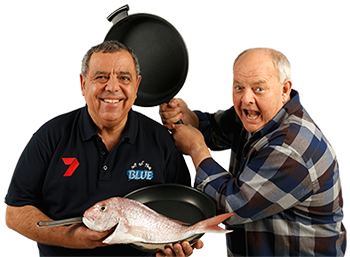 Meet Michael Angelakis and Michael Keelan: two mates who decided to get together with a BBQ, some fish, some great locations and a camera to create a cooking show. They’re not professional chefs, and sometimes they even burn the food! But they love cooking – and what’s more, they are very entertaining! 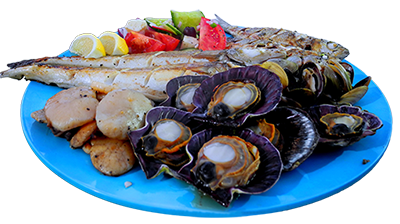 Michael Angelakis is a well-known South Australian fish monger who knows anything and everything to do with seafood. Michael Keelan is a horticulturist, who likes a good dose of chili in whatever he’s cooking. What’s he doing on a seafood cooking program? He has no idea, but he keeps Michael Angelakis in line and makes sure some kind of dish comes up at the end of the day. From the coastline of South Australia to the cobblestone streets of Italy, Out of the Blue will open your eyes to great new dishes and great places to travel. This season, the Two Michaels have partnered with a number of South Australian, Western Australian and Tasmanian wineries to explore how seafood and wine can come together to create perfect meals. In each episode, the boys will match a wine to their recipes, talking to local winemakers and visiting cellar doors to learn everything there is to know about wine matching and creating the perfect drop.